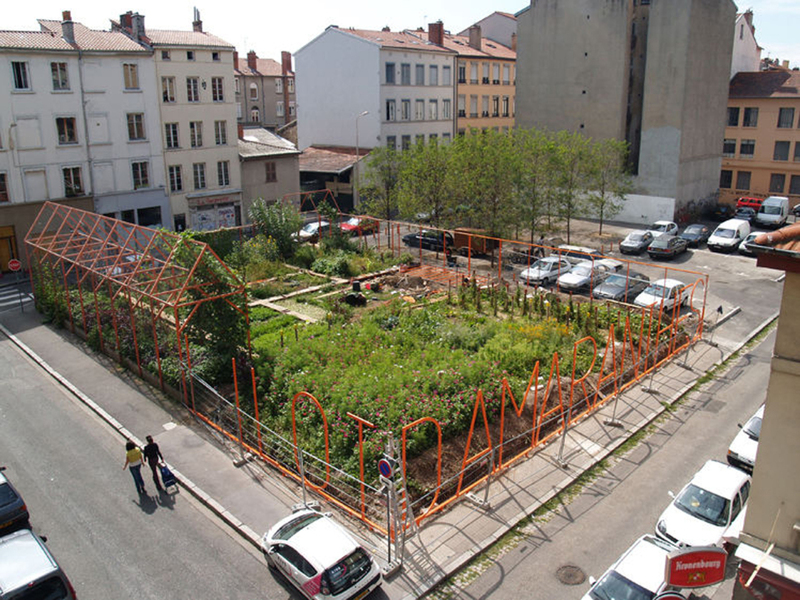 2003 : Roger Talor gallery, as part of “urban policies” invites the artist Emmanuel Louisgrand to create a temporary garden at the corner of Sebastien Gryphe and Montesquieu street, on the wild parking site. Creation of a greenhouse gathering several varieties of plants. 2004 : The residents invest plot by installing gardens.The area of intervention is extended : pieces of land are separated by wooden footbridges and attributed to some residents who garden together. The association Brin d’Guill (citizens Gardens neighborhood association of Guillotière) forms himself to occupy the shared garden. 2006 – 2007 : Demolition of the last building on the plot. This demolition enables the islet to extend one last time. Brin d’Guill becomes manager of the gardens of l’îlot d’Amaranthes. Graphic work is focused on closing. 2009 : Creation of Les Compostiers Association whose goal is to install composter at Cluzan street. They take account on the support Brin d’Guill to develop composting. 2011: Invited by the Brin d’Guill association, the Brazilian street artist Eduardo Kobra created a fresco in the front of the greenhouse wall. This artwork represents an argentic photography of a group of black and white people. This group of men, women and children posing in front of the coffee is akin to a family photo. 2013 : Start of construction of the Mazagran space : Greater Lyon (regional government) coordinates an extensive urban renewal program in the area between the streets Jangot, Gryphe, Mazagran and Montesquieu. The program aims to redefine and revitalize the area by designing new public spaces and green areas. •The Roger Tator Gallery (an exhibition of contemporary art, design, digital art, architecture) initiated the Îlot d’Amaranthes project. •Emmanuel Louisgrand (artist), Jean-Luc Bersoult (industrial designer) and Christelle Morel (project manager) reinvested a land in the 7th arrondissement of Lyon. This was initially destined to be built and then abandoned. •Brin d’Guill, a citizens gardens association of la Guillotière wanted to transform an abandoned urban garden into community gardens. •Les Compostiers / Association that promotes the urban community composting. •Management of green spaces of the city of Lyon / Manages planted areas. •Tous l’monde dehors (Everybody outside), City of Lyon, Politics Department of the city, DRAC (Regional Direction of Cultural Affairs) / Funding . •The residents of La Guillotière district. L’îlot Amaranthes has become a landmark in the living environment of residents. Recognizable by its structure and typographical orange fence, the artist gave a graphic dimension to its work. The orange color is often associated to public works, it is willing to report. The color enables to sign this public space, it helps to better identify open space.